Aerobic endurance was trained utilizing a football circuit/dribbling track in youth (1) that was tested for its validity in professional players (2). 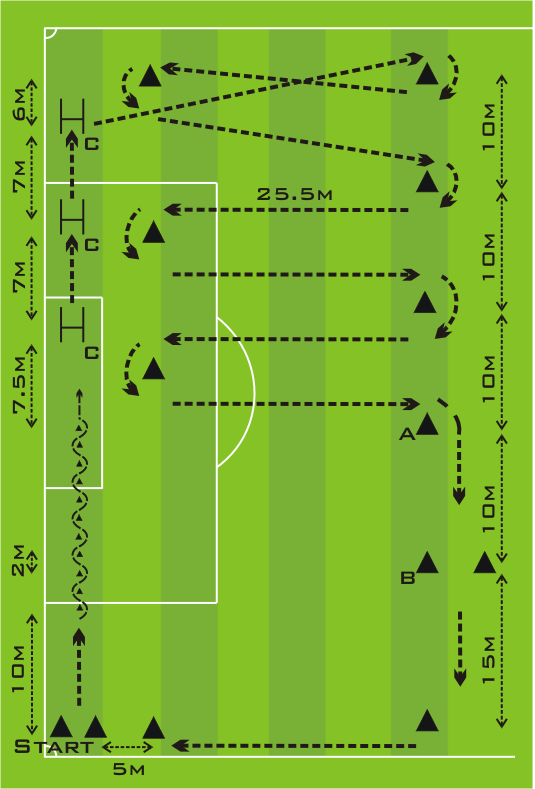 In the so-called Hoff-test (please see figure below), players had to dribble a ball (forwards and backwards) around cones. A total area of 30 × 50 meter is needed to setup the test. The size of the test fits perfectly into one half of a regular football pitch. Therefore, two Hoff-tests can be setup and more players can be trained at the same time. A measurement tape (to set up the distances) and some cones are required. If an entire football pitch is used (and therefore space for 2 Hoff-tests is available), we believe that an entire team (up to 18 players) can be trained with the Hoff-test. Players need to be separate on the test (and therefore all players can start at the same time) or start one after another with a time delay of 5-10 seconds. Players start dribbling at "Start" in clockwise direction. At "C" players need to lift the ball over a 30 cm high cone and jump over the hurdle. From "A" to "B" players will dribble the ball backwards. The protocol duration and intensity was set to 4 minutes at 90-95% of maximal heart rate. Four sets with 3 minutes of recovery jog at 70% of maximal heart rate were performed twice for 8-10 weeks (1). The players improved significantly in VO2max and as a result the football circuit/dribbling track seems to be an effective tool to train football specifically (1). training in professional youth soccer players. Br. J. Sports. Med. 39(5): 273-277, 2005. 2. Hoff, J., et al. Soccer specific aerobic endurance training. Br. J. Sports.